I suppose it's a case of absence makes the heart grow fonder. Or perhaps it's the more selfish but very American "If I can't have it, I want it". I any event, I find my thoughts lately wandering overseas and all those places I won't be able to see for a couple of years while C-boy (hopefully...please God) grows more travel able. Of course with me I only have to have a glimmer of France, particularly Paris, in my head and I immediately start wandering in my mind and appetite. Strolling around the Marais, stopping here and there for café au lait and brioche. 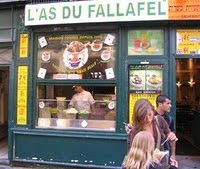 Making a mid-afternoon fueling stop at L'as du Fallafel for one of their out of this world falafels. Taking in the solemn and celebratory beauty of the L’église Saint-Eustache, my favorite Parisian church. Of course dinner at a cozy bistro is never far away....except for now. So I have to satisfy some of my needs at home. Lots of French wine, for sure. 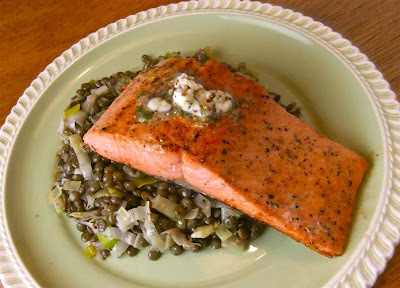 And if I happen to have a deserving bottle of Bourgogne Blanc calling my name, then what better to pair it with than a classic of French cooking, Saumon aux Lentilles. This is so simple, just a fresh salmon fillet topped with a mustard-herb butter, resting on a bed of French green lentils. In these days of unsatisfied wanderlust, I'll take my vacations where I can find them, even at my dinner table! Stir together all ingredients with 1/4 teaspoon each of salt and pepper. Bring lentils, water, and 3/4 teaspoon salt to a boil in a heavy medium saucepan, then reduce heat and simmer, uncovered, until lentils are just tender, 20 to 25 minutes. Remove from heat and let stand 5 minutes. Reserve 1/2 cup cooking liquid, then drain lentils. While lentils cook, chop leeks, then wash. Cook leeks in butter in a heavy medium skillet over medium-low heat, stirring occasionally, until softened, 6 to 8 minutes. Add lentils with reserved cooking liquid to leeks along with 3 tablespoons mustard-herb butter and cook, stirring, until lentils are heated through and butter is melted. Add lemon juice and salt and pepper to taste. Remove from heat and keep warm, covered. Pat salmon dry and sprinkle with 1/2 teaspoon salt and 1/4 teaspoon pepper (total). Heat butter in a large nonstick skillet over medium-high heat until foam subsides, then sauté salmon, turning once, until golden and just cooked through, 6 to 8 minutes total.